The InAs wetting layer evolution during MBE growth on a GaAs(001) substrate starting from the bare GaAs surface up to quantum dot formation was investigated by in-situ STM . 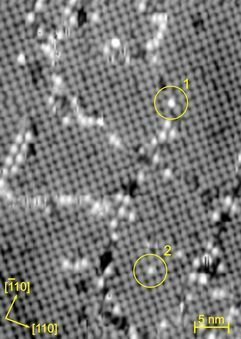 For low InAs coverages, indium signatures at the GaAs(001)-c(4×4) surface were observed, either sticking to dislocation-like surface defect lines of the GaAs(001)-c(4×4) surface or being located at the hollow sites of the unpertubed GaAs(001)-c(4×4) reconstruction [1,3]. 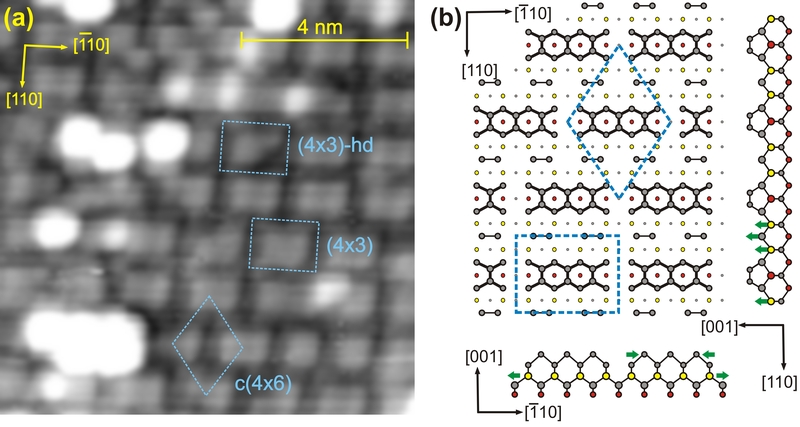 At a coverage of 0.67 monolayers of deposited InAs an abrupt change of the surface occurs leading to a In2/3Ga1/3As monolayer with a (4×3) reconstruction . Each unit cell is characterized by a block of three arsenic top dimers while occasionally also hetero-dimers occur. These unit cells are arranged in-line or brick-lined. Further deposited InAs is arranged in three differently reconstructed islands on top of the In2/3Ga1/3As-(4×3) reconstruction. These islands show a (2×4) periodicity and only differ in the number and position of the arsenic top dimers, resulting in a β2(2×4), an α2(2×4) and a modified α2(2×4)-m reconstruction. deposition then leads to quantum dot formation. The different phases of the wetting layer could be related to a compensation of compressive In-related strain by tensile strain from As dimers. The indium signatures on the GaAs(001) surface (bright features), sticking to dislocation-like surface defect lines (marked by 1) or to the hollow sites of the undisturbed c(4×4) reconstruction (marked by 2) [1, 3]. (a) STM image and (b) structural model of the In2/3Ga1/3As layer consisting of (4×3) reconstructed unit cells leading to an in-line (4×3) or a brick-lined c(4×6) assembly of the dimer blocks. [2, 3]. 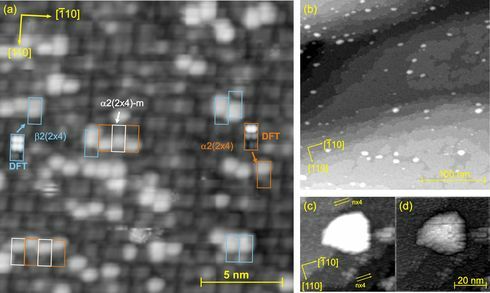 (a) Different (2×4) reconstructed InAs islands covering the InGaAs (4×3) monolayer, and (b-d) quantum dot formation above 1.42 ML of deposited InAs . Atomic structure and strain of the InAs wetting layer growing on GaAs(001)-c(4×4), C. Prohl, B. Höpfner, J. Grabowski, M. Dähne, and H. Eisele, Journal of Vacuum Science and Technology B 28, C5E13 (2010).